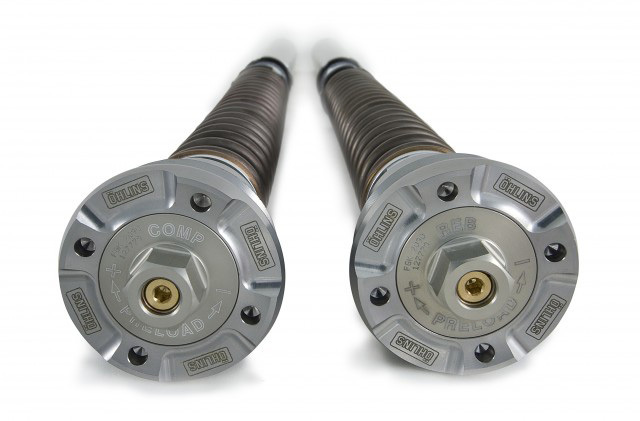 Ohlins makes a front and rear matched set unlike other brands that may just offer a rear shock. 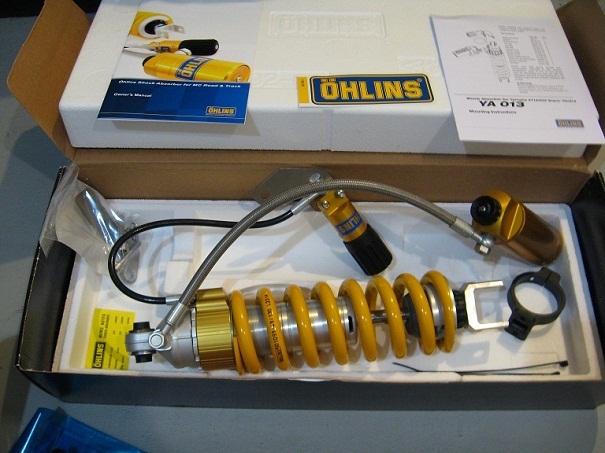 The Ohlins Shock is surprisingly affordable and very heavy duty, a large 46mm body and 16mm shaft with adjustable compression, rebound and hydraulic spring preloader and suits a large range of practical use. 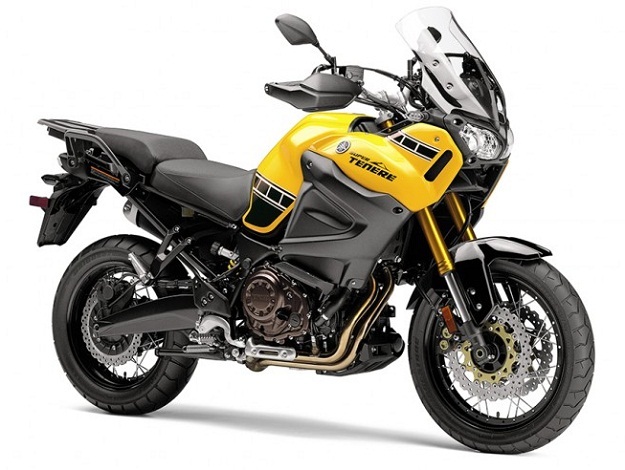 Super Popular TENERE OHLINS YA013 Shock! With Adjustable Rebound (45 clicks aprox. ), Compression (24 clicks aprox. ), Preloader (aprox. 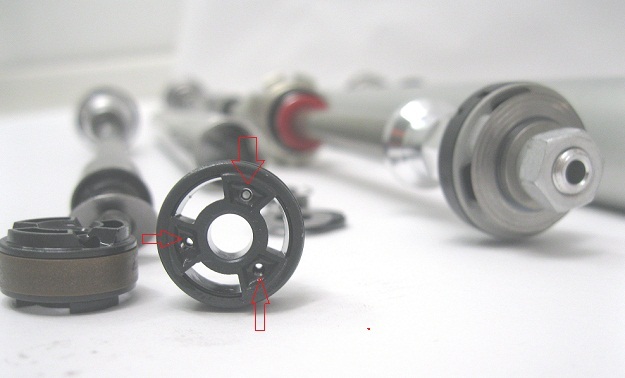 24 turns ) 46mm body and 16mm Shaft, excellent value, function and to quality. It’s hard to find a better All Around Shock For the Money! If a various real world riding from commuting to trail, one and two up and a couple camping journeys, its hard to find any better well rounded shock on the market for this price. 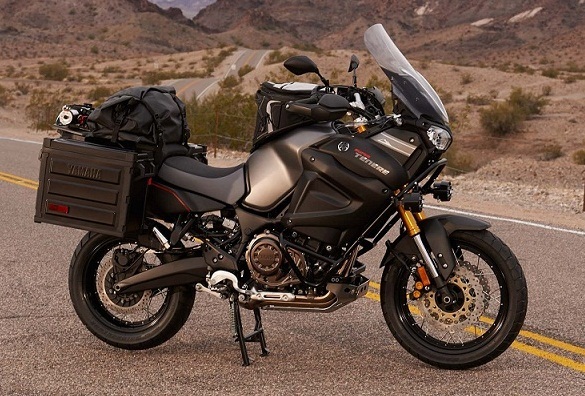 The standard Yamaha “too-soft” and “weird too much” rated upside down horrible Tenere fork spring is use less unless you are 175 lbs or so….., plus cloths, mostly solo and never leave the pavement on the way to Starbucks Only commuter that doesn’t know any better, (See Pics and More Info Below page…). 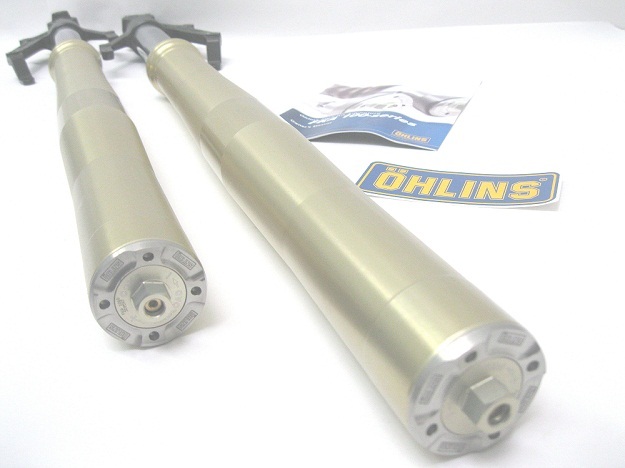 Above Ohlins 30mm Cartridge Kit, once you see how well the rear shock works, you’ll want to upgrade the Forks! 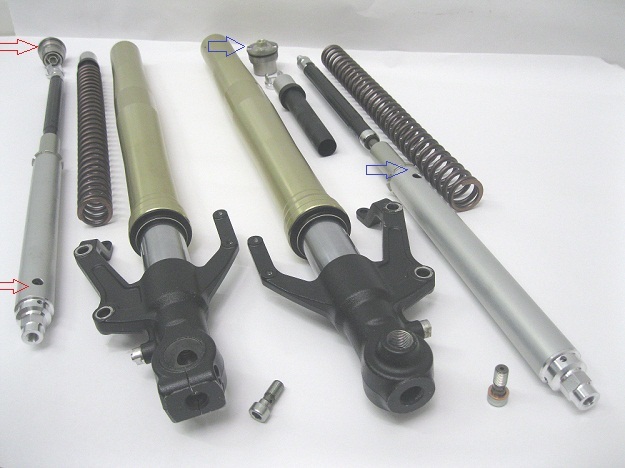 The Ohlins Fork Cartridge and spring kit has 50% larger 30mm pistons with externally adjustable fork preload, rebound, and compression with anti bottoming hydraulic cones. 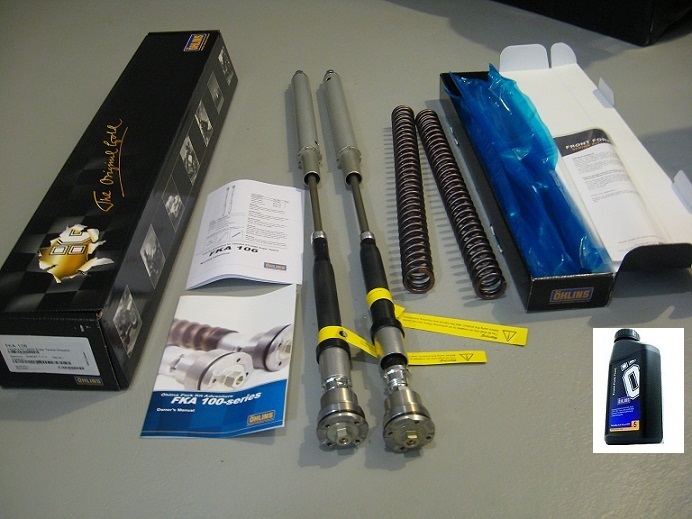 TENERE OHLINS Fork 30mm CARTRIDGE Kit FKA106 and Spring Set Kits (replaces most everything inside fork). 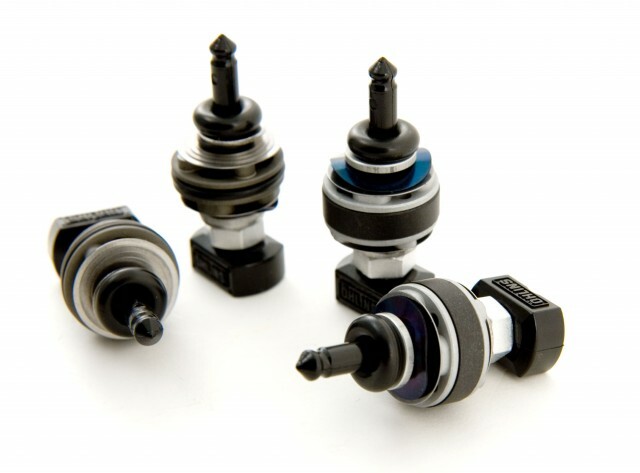 Kit has many Unique Features the standard does not including Adjustable Compression, Rebound and Spring 18 turn Preload all at the Top caps and special anti bottoming tapered hydraulic cones. 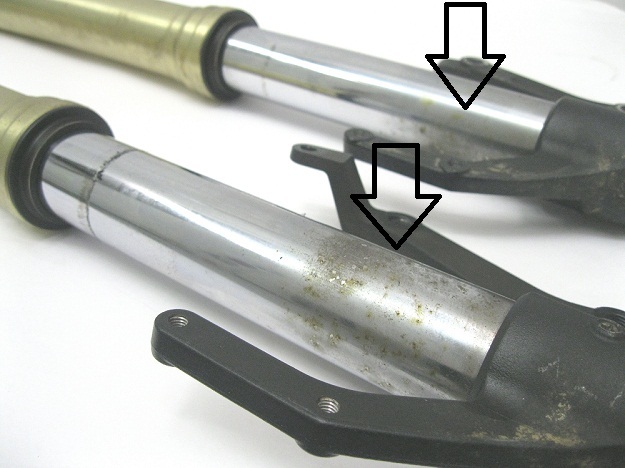 This is a couple season old leaking Tenere Fork, notice the pitting towards the bottoms of the sliders, good reason to keep you bike cleaner than these and not store your bike really muddy as some inners would need to be replaced. Above black arrows show the pitting on inner tubes. Above shows cracked rubber wipers seals after only two seasons. 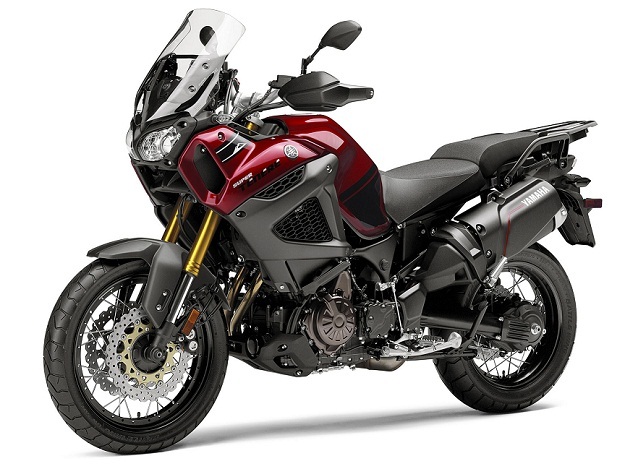 The standard Yamaha “too-soft” weird too much rated upside down horrible Tenere fork spring is use less unless you are 175 lbs or so….., plus cloths, mostly solo and never leave the pavement on the way to Starbucks Only commuter that doesn’t know any better. 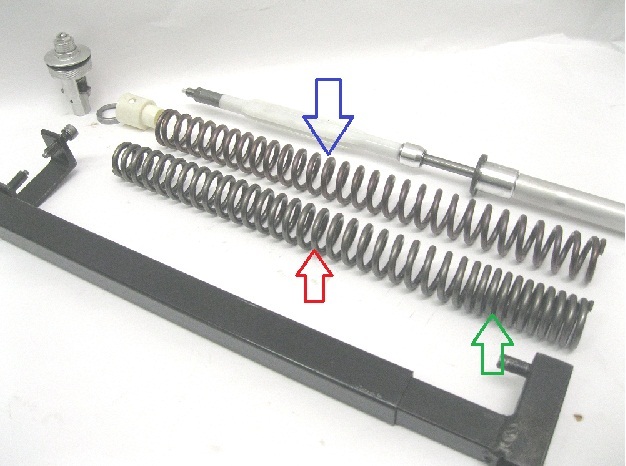 Above standard Tenere fork spring is the progressive coil shown with red arrow, Ohlins spring is blue arrow and requires 5mm more spacer to be used in standard application with standard preload. The green arrow shows how tight the coil is found on one end of the 7.5″ (190.5mm) travel application. 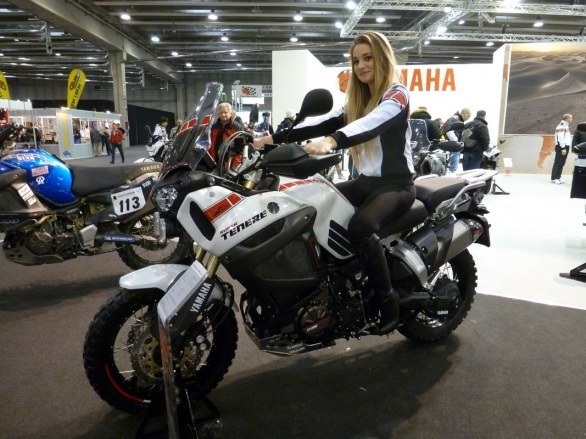 The standard Tenere forks progressive coil spring rates pretty weird ! 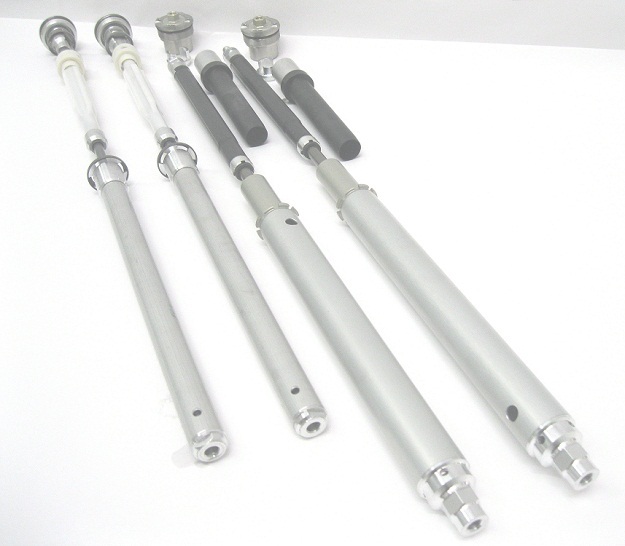 Above right the Ohlins 30mm piston and Cartridge kit they are 50% larger than stock on left, with a 20% larger rebound rod and taller 55mm hydraulic anti bottom cone. 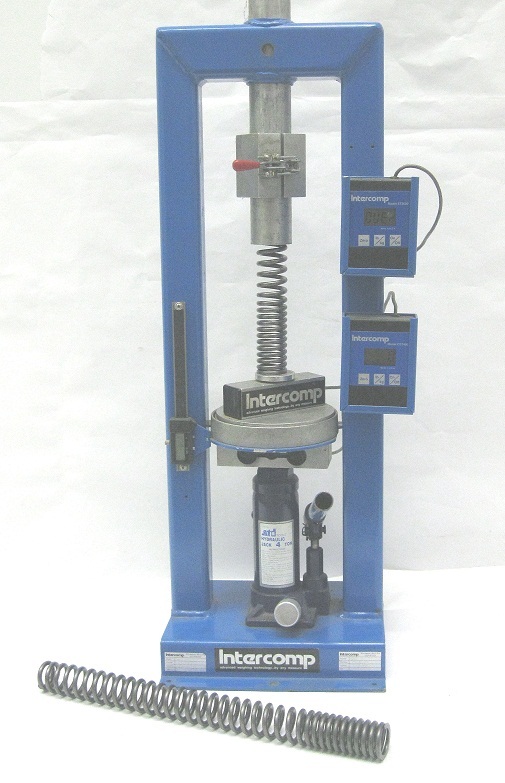 The Standard cartridge is a 20mm low flow setup from the 1980’s. Super dated 20mm fork pistons that come on the Tenere are from decades ago and still found in these bikes today, the red arrows show just how very tiny the standard compression holes are in the Tenere three port 20mm compression piston. Red arrows are the standard Tenere 20mm fork piston, we saw these from the 1980’s on the offroad side, the new 30mm Ohlins kit is on the right. 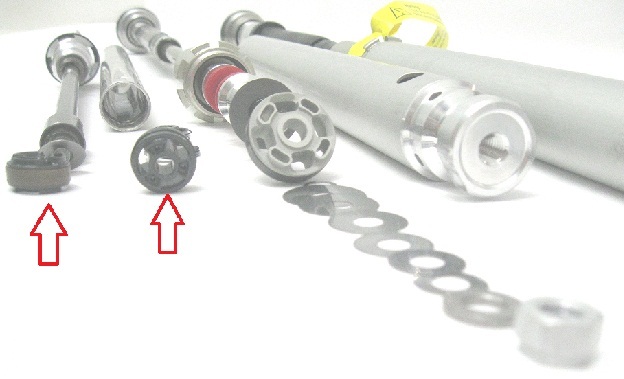 You can use an Ohlins prevalved 20mm four piston kit shown above or replace to the 30mm full cartridge with every thing Ohlins from the cap to the bottom bolt. 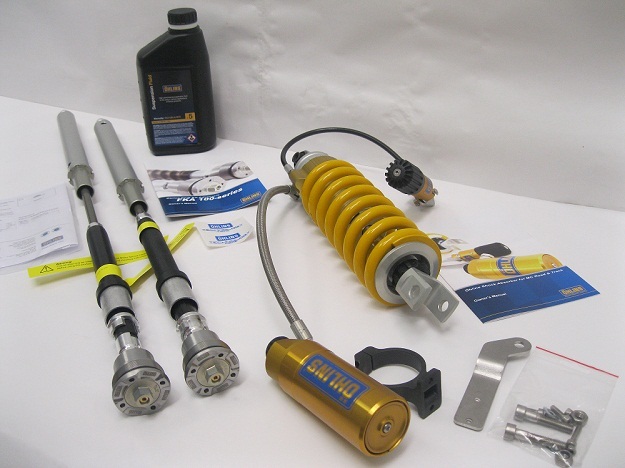 The Ohlins Kit can be owner installed with out any machining and is 100% reversable. 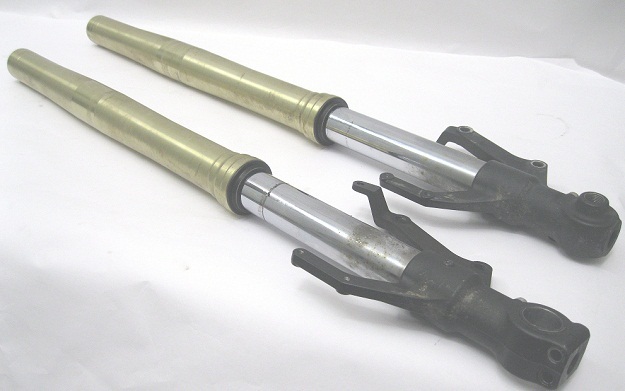 Basically install the Rebound side stuff in the right leg as shown, then the left side compression leg stuff, add fluid which takes less than 1 litre Ohlins fluid to do whole fork set. 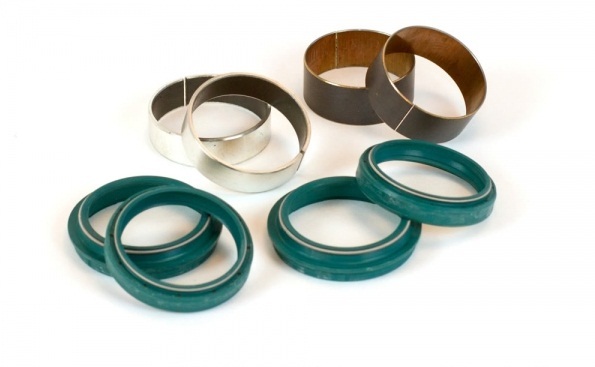 SKF fork seals, Wiper seals and bushing kits are a popular option. 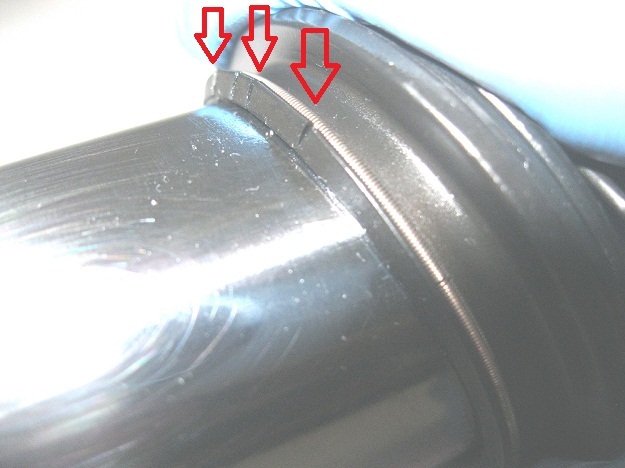 Preset your preload on fork cap, and rebound and compression with the 3mm allen as shown in manual.